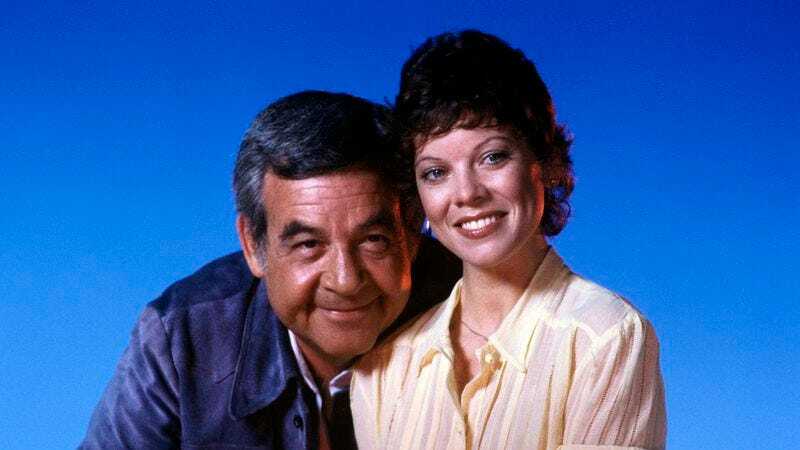 Variety reports that Erin Moran, the former child actor who starred for nine years on Happy Days and its short-lived spin-off Joanie Loves Chachi, has died. Moran was 56. Moran began working as young as 5, and scored a regular gig on the kids’ veterinarian drama series Daktari when she was 8. (A favorite role, apparently, because it meant she got to work with animals.) From there, she landed regular guest-starring roles on everything from Gunsmoke to The Courtship Of Eddie’s Father, before winning the role of one of TV’s archetypal little sisters on Happy Days in 1974. As Joanie Cunningham, the sister to Ron Howard’s nerdy Richie, Moran was called upon to play any number of roles: bratty kid sister, lovestruck teen, cutting wit, rebellious smoker, and, ultimately, romantic lead. That last title earned her—and co-star Scott Baio—their own spin-off, although Moran said in later years that she would have rather stayed with her Happy Days family instead of striking out on her own. Unfortunately, ratings caused Joanie Loves Chachi to last only a single year on the air, a blow that Moran’s career never recovered from. She spent the next 30 years working sporadically, appearing on the occasional game show or reality program, and reportedly drinking heavily. With occasional flashes of her old success, but even more disappointment, Moran’s career arc mimicked that of so many child stars (up to and including a cameo appearance in David Spade’s bizarre ode to the damage wrought by the lifestyle, Dickie Roberts: Former Child Star.) Her last regular gig was as a contestant on Celebrity Fit Club, and she was living in Indiana when her body was found unresponsive by police today. Moran had apparently recently been evicted from the mobile home park where she was living with her husband, for public disturbances and excessive drinking. Moran’s former Happy Days cast members took to social media tonight to mourn her, choosing to remember her for her talents and her kindness, and not the obvious pain that blotted out so much of the latter part of her career.